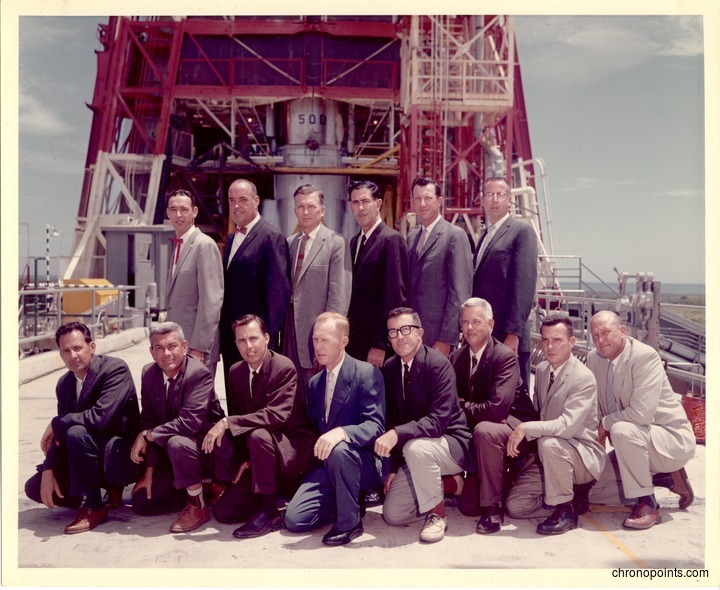 The engineering management team in front of Mercury-Atlas 1, an unmanned test rocket Cape Canaveral Air Force Station (CCFAS) in Cape Canaveral, Florida, in July of 1960. This was the first test of an Atlas D booster along with a Mercury capsule. The test was a failure, as the rocket exploded shortly after launch. Photographed standing, from left to right, are Curt Johnson, Test Conductor for Launchpad 14; T. J. O'Malley (1915-2009), Test Conductor for Launchpad 11; Trav Maloy, Chief Test Conductor for CCAFS; Bill Taylor, Test Conductor for Launchpad 12; Walt Hicks, Data Analyst; and Jack Moline, Test Conductor for Launchpad 13. Kneeling, from the left to right, are Orion Reed, Complex Engineer for Launchpad 12; John Hughes, Complex Engineer for Launchpad 13; Bobby Danner, Missile Engineer for Launchpad 12; Dr. Cal Fowler (1929-2013), Missile Engineer for Launchpad 14; Ernie Baldini, Missile Engineer for Launchpad 11; Ken Wilcox, Design and Hanger Checkout; John Fox, Missile Engineer for Launchpad 13; and Bill Williams, Complex Engineer for Launchpad 14. O'Malley later launched John Glenn's (1921-) Friendship 7 rocket. Dr. Fowler later launched astronauts Scott Carpenter (1925-2013), Wally Schirra (1923-2007), and Gordon Cooper (1927-2004) into orbit. Original color photographic print, July 1960: Private Collection of Dr. Calvin D. Fowler. Digital reproduction of original color photographic print, July 1960. "MA-1 (8). John F. Kennedy Space Center, National Aeronautics and Space Administration. http://www-pao.ksc.nasa.gov/history/mercury/ma-1/ma-1.htm. 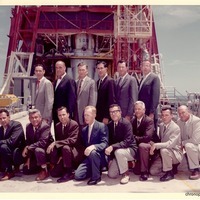 “Project Mercury Test and Launch Engineers in Front of Mercury-Atlas 1.” RICHES of Central Florida accessed April 18, 2019, https://richesmi.cah.ucf.edu/omeka/items/show/6389.